Balance bike for toddlers. What is this type of bike exactly? 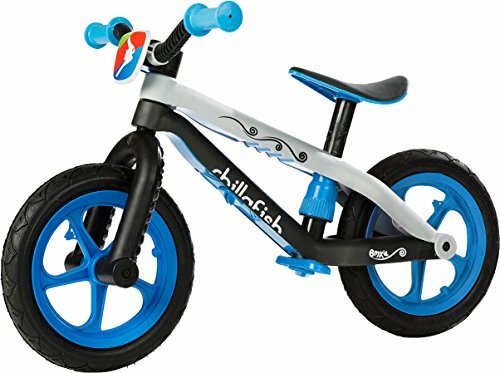 It is essentially a small two-wheeler glider bike for children which allows them to push the bike along with their feet, and eventually, learn how to lift their feet up to glide along. 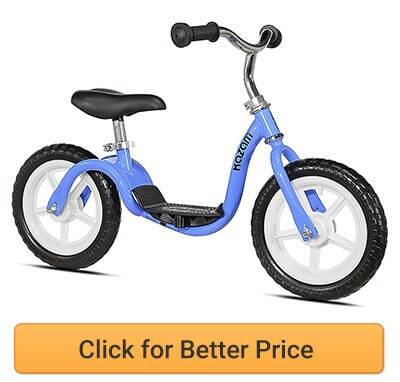 Nevertheless, not all of these glider bikes are created equal and the available options are endless, that’s why today’s article will help you find the perfect bike for your tyke in a sinch! 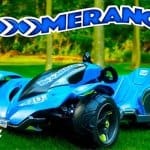 Below is the list of the most popular balance bikes for kids for your overview. After that, we will go deep into the top 5 bike models. Here is a brief overview of some of the best models glider bikes on the market and what they have to offer. 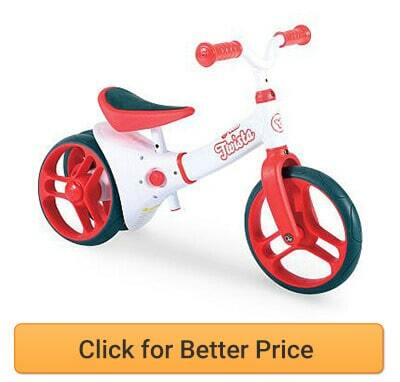 Further below, we will provide a deep dive of each of these toddler bikes. Specifically designed for younger children. Appropriate ages: 30 months to 5 years. Heavier weight for extra stability. Foam tires for indoor and outdoor use. Appropriate ages: 18 months to 5 years. Appropriate ages: 3 to 5 years. Lowered mid-bar for easy mounting. The Cruzee UltraLite is made from rust-free anodized aluminum for an extra-long lifespan. 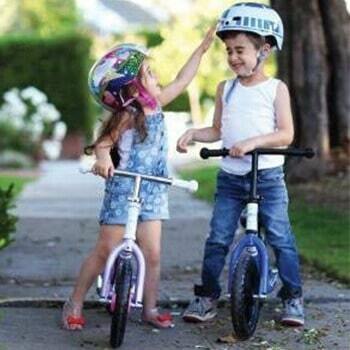 This makes the bike ideal for families who eventually pass the bike down to younger siblings. Another impressive aspect of this pedal-less bike is that the manufacturer provides a lifetime warranty. An extra wide seat ensures a high level of comfort, and the seat and handlebars can be easily adjustable. 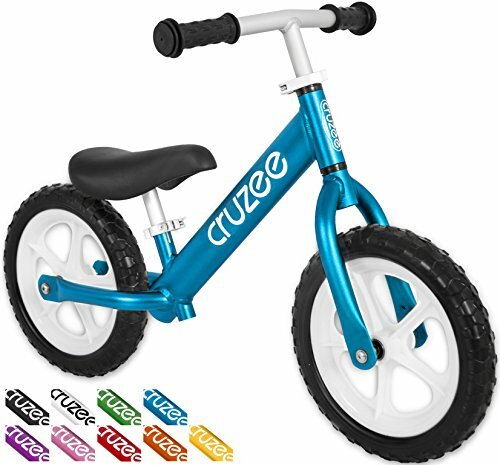 There are 14 color combinations to choose from, so your child can have a bike in their favorite color. The tires are made from a type of foam rubber that makes them impossible to pop. Perhaps one of the nicest features of this bike is that it is extremely lightweight, only weighing about 4.4 lbs. This makes the bike ideal for children who may have struggled with heavier bikes in the past. 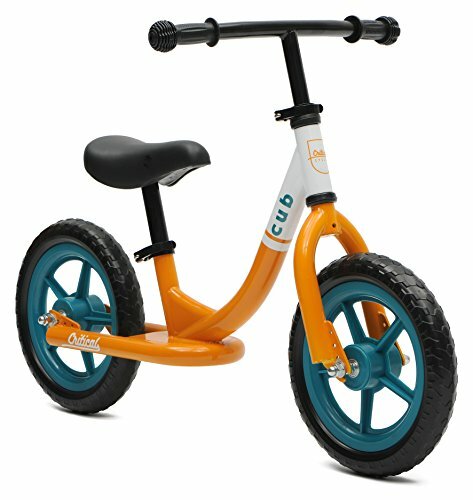 Customers note that the lightweight of this pedal-less bike makes it effortless for children to pick-up and mount on their own. They also report that the assembly process is fairly easy and only takes around 10-15 minutes and that the bike is of a high quality. On the downside, customers note that this bike is a bit more expensive than other pedal-less bikes on the market, however, most customers say that this product is definitely worth the price. In some instances, the handlebars may be difficult to properly tighten. The material of the tires makes an odd sound when it comes in contact with various surfaces. 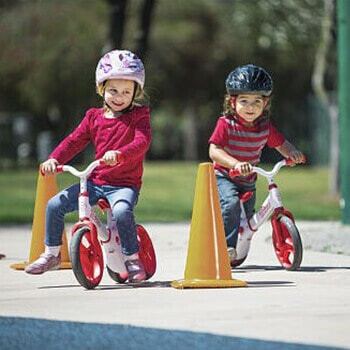 TRY A DIFFERENT APPROACH TO LEARNING - Skip tricycles and training wheels. On a no-pedal blue Cruzee balance bike children LEARN TO BALANCE FIRST on two wheels. Pedaling on a traditional bike comes easy after learning on a Cruzee. 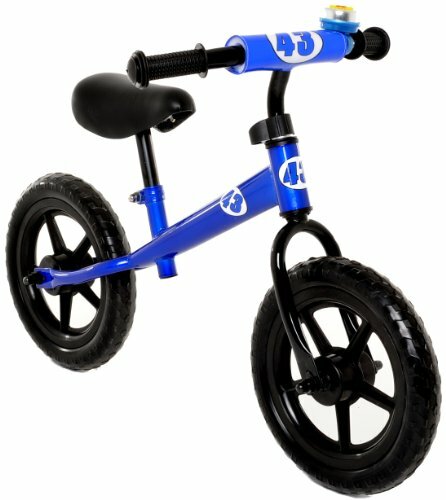 The Twista by Y Velo balance bike is a truly unique, thanks to its innovative wheel adjustment function. This function enables the wheels to move closer together or farther apart, which allows the bike to be customized in correlation to the child’s progress. 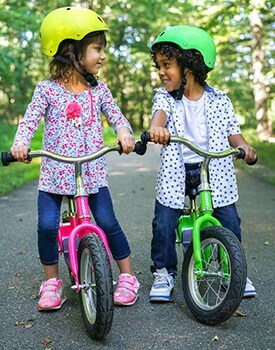 For younger riders, the two wheels in the back can separate from each other to provide to form more of a tricycle type of design, providing extra stability. 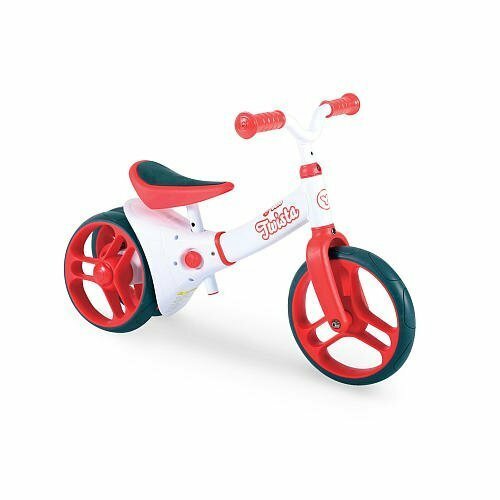 Once the rider has become more confident and skilled on the bike, the wheels can close back together with a click of a button to form a true balance bike. Like most other bikes of this kind, the seat and handlebars on this Velo model can be easily adjusted. 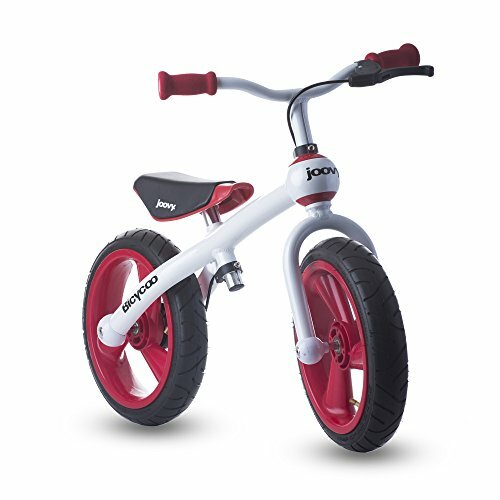 However, while many other toddler bikes feature plastic wheels, this model incorporates shock-absorbing rubber wheels. Customers who have purchased this bike have noted that the rubber tires make it ideal for both indoor and outdoor riding and that the bike is well-made. 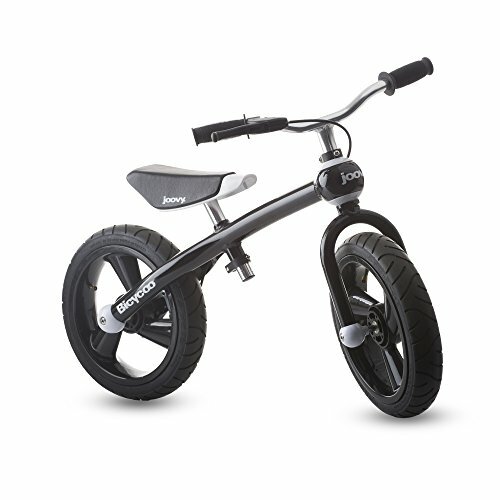 Most customers note that the bike is best for children who are toddler aged. However, children under 18 months might struggle. A great option for toddlers who may be too small for other bikes. Innovative double rear wheel functionality. The bike’s functions grow with the child’s abilities. The innovative adjustment features cause this bike to be fairly heavy compared to other bikes, at 11.86 lbs. Some kids may quickly outgrow this bike. This Critical Cycles Cub no-pedal bike has been designed with a frame that allows for easy mounting. The bike is maintenance free, as it features air-less tires and only requires minimal assembly. 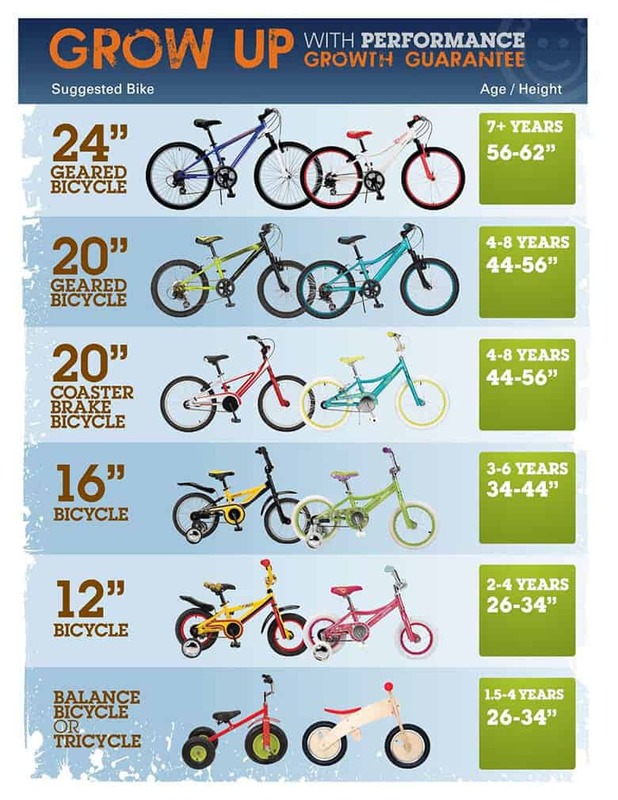 Appropriate age ranges for this bike are between 30 months and 5 years. 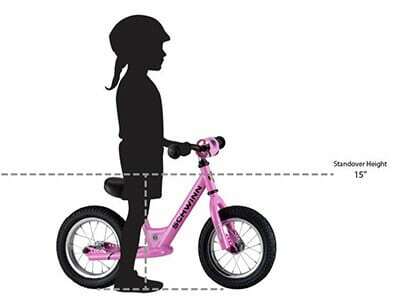 Easily adjustable seat and handlebar height allow the bike to be routinely customized as your child grows. The frame is made from high-tensile strength steel, which makes it super strong, and the tires are puncture proof. The manufacturer of this bike notes that this bike has been designed to be less likely to tip-over, which may be ideal for riders who have lacked confidence in other types of bikes. One important thing to note about this bike is that it weighs 9 lbs, which is a bit heavier than most of the other bikes on this list. While this bit of extra weight likely adds to its stability, it may pose a handling problem for children who are on the smaller side. 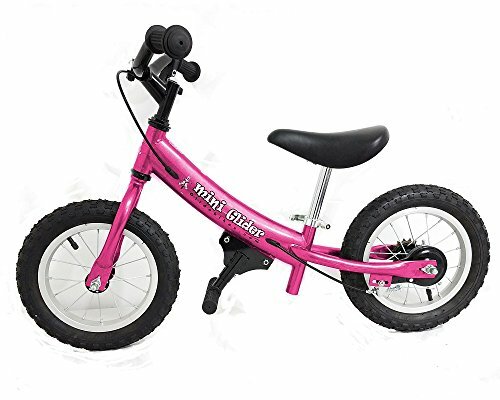 Customers who have previously purchased this bike have noted that their children generally respond positively to this bike, and helps them to feel more in control. Customers also like that the tires are made out of foam, which makes the bike appropriate for both indoor and outdoor riding. Other customers have noted that the bike was super easy to assemble, as the frame comes with the tires already attached. Some issues that customers report with this bike are that the wheels may be squeaky in some cases, and the bike may be too heavy for younger riders. Assembly only takes about five minutes. Very durable, even after years of use. The 9 lb. weight makes it more stable. Very easy to adjust seats and handlebars. The 9 lb. weight makes it rather heavy for some riders. Some elements of this bike could be of a higher quality. 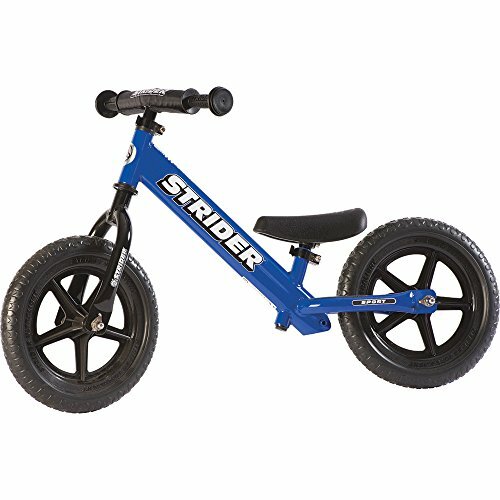 This Strider balance bike is intended for children between the ages of 18 months and 5 years, according to the manufacturer. The bike weighs about 6.7 lbs, so it is ideal for the younger age range that this bike supports. 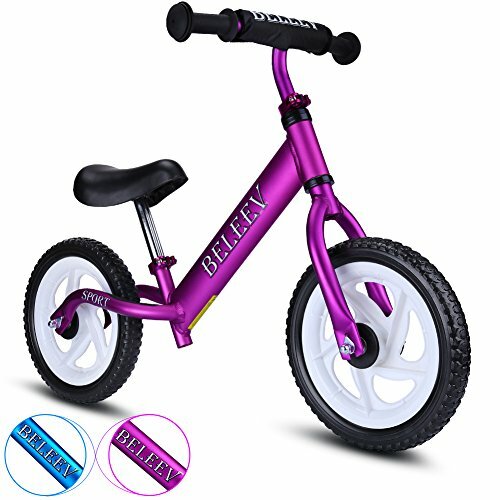 Additionally, this no peddle bike is known for its durability and puncture-proof tires, therefore, it may be a good choice for children who are on the rough-and-tough side. 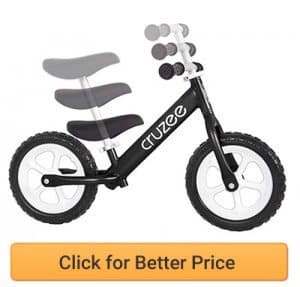 One of the special features of this bike is its well-padded seat, which enables children to remain on the bike comfortably for long periods of time. The Strider 12 Sport has an adjustable seat height that extends to 19 inches and does not require any tools to adjust. Some assembly is required, however, the assembly process is relatively easy. As your child grows, the handlebars can be adjusted as well, and the bar grips have been designed small enough that they can fit comfortably in a toddler’s hand. 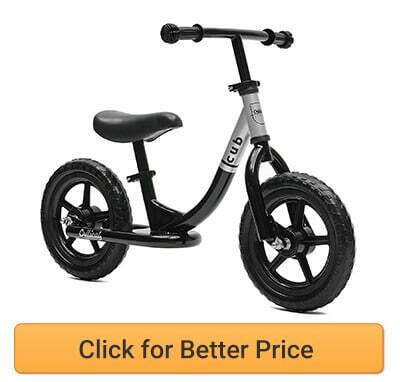 Customers who have purchased this product noted that this bike was suitable even for 5-year-olds who are significantly larger than average. They have also stated that the footrests come out just enough to hold the feet while gliding, but not so far that they hit the child’s legs when their feet are on the ground. On the downside, customers have noted that in some instances, the wheels on their bike didn’t turn smoothly and may have needed to be oiled or exchanged. Other customers noted dissatisfaction with the fact that tires are not made of rubber. The high quality of this bike. It’s super light weight makes it easy for a parent to carry if the child gets tired. Includes two different seats so parents can easily upgrade the bike as their child grows. The seat can be adjusted down low enough to be comfortable for a 2-year-old. The tires do not have much tread. 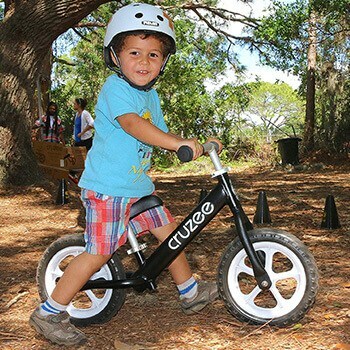 The KaZAM balance bike was a product featured on the well-known show ‘Shark Tank’! This bike is appropriate for children 3-5 years. The manufacturer advises that this bike is not suitable for children under the age of 3, due to small parts which pose a choking hazard. The total weight of this bike is around 8 lbs, which should make it rather effortless for most children to handle. 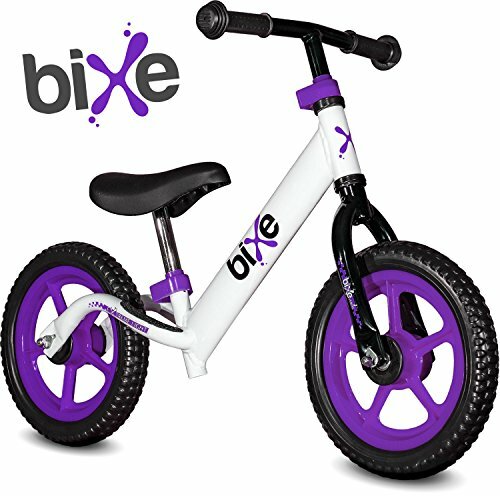 What makes this bike unique compared to the other bikes on this list is that it features a unique design that allows children to easily mount the bike. This feature also doubles as a footrest for costing, which serves to help children more effectively identify their center of gravity and prevent their feet from dragging on the ground. 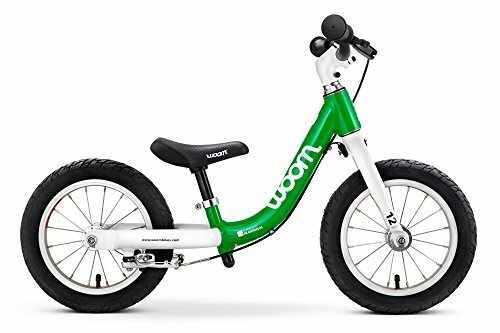 If you are a parent who appreciates the convenience, you’ll likely be glad to know that this bike features special tires which never need to be refilled and are resistant to blowouts. The seat and handlebars can both be adjusted, with the seat easily raising and lowering between 13.5 and 16.5 inches and the handlebars raising and lowering between 19 and 20.5 inches. 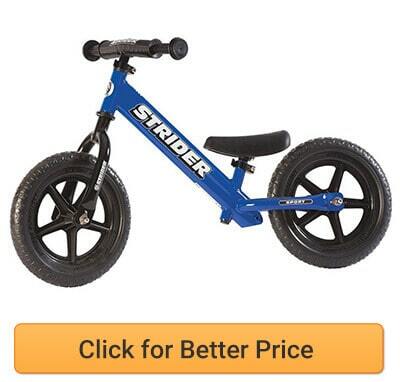 Consumers who have purchased this bike have compared its quality to the Strider balance bike, and have noted that the KaZAM is available at a lower price. They have also made positive comments regarding its craftsmanship, that their children were able to quickly learn how to use this bike, and that the footrest really makes a difference when it comes to the child learning about balance. 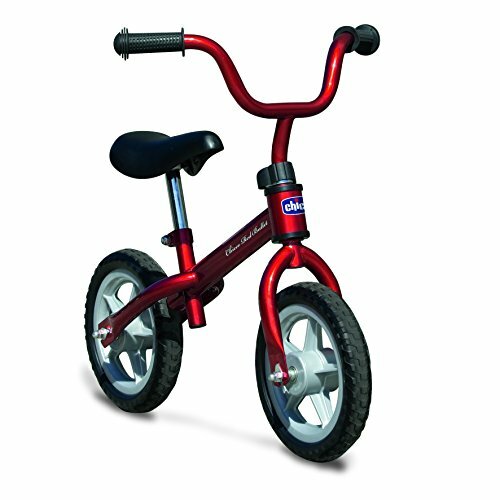 A great option for children who may have had struggles learning to balance on other bikes. Acceptable for children who are both short or tall for their age. Little wear and tear over time. The wheels are made of a thick plastic rather than rubber and may not grip as easily on some surfaces. In some instances, the handlebars may need to be loosened to make the bike more easy to maneuver. KaZAM's Footrest is in the natural place, where feet would be if coasting on a pedaled bike, helping to find their center of gravity. Wondering why balance bike is such a trending toy for last few years? Ahhh, there’s nothing quite like the feeling of the open road, to be able to zoom across the land like a bird flying through the sky. 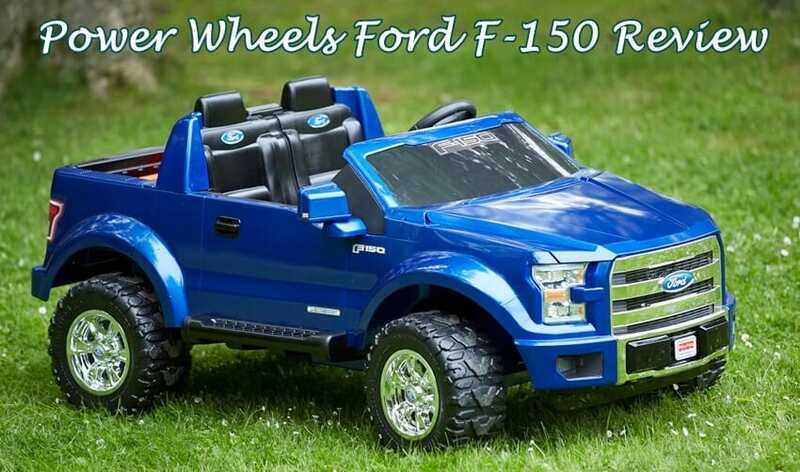 The love of this feeling is something children and parents both enjoy, which is why wheeled toys have been popular among children for generations. And will probably continue to be popular for generations to come. Balance bike becomes even more popular than kick-scooters and other ride-on toys. However, younger children can often feel left in the dust when they see older kids riding around on two-wheelers, while they are still stuck using their tricycle or training wheels. Not to mention, these ways of riding don’t really help the child learn the proper balance skills required to move up to a two-wheeler easily. The child’s feet should be able to completely reach the ground with both feet. The best way to ensure this is to measure your child’s inseam and choose a bike with a seat height that fits this measurement. Keep in mind that most of these bikes are adjustable so you can raise or lower the seat as your child grows, or to share between children of different sizes. The weight of the bike is important because a bike that is too heavy could make it difficult for a child to handle and control. Additionally, a bike that is too heavy for your child will make it difficult for them to pick-up off the ground and mount. However, it should be noted that a heavier bike will also afford durability and dependability, which is something to keep in mind if your child is a bit more rough-n-tough, or feels timid about falling. 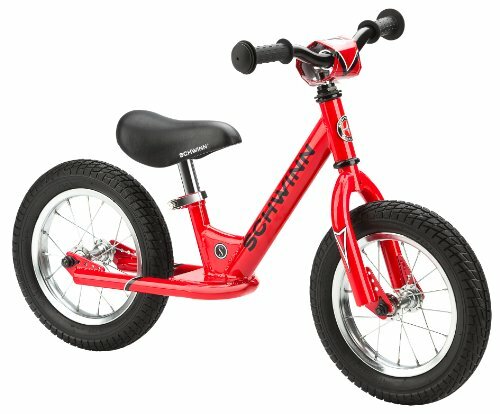 Generally speaking, these types of bikes are most suitable for children between the ages of 18 months and 5 years. However, some bikes work better for the younger vs. older end of this spectrum and vice versa. For younger kids, look for bikes that have a wider seat to help them feel more comfortable and secure on the bike, are lightweight for easy handling. They also have tires that can be used on indoor flooring without scratching, such as rubber or foam tires. For older children, look for a bike that has a strong, durable frame and unpoppable tires (usually made of a high-quality plastic material) as these attributes will better support the weight of the child and the bike will last even when handled roughly. The child’s own abilities are an important factor in choosing the right bike. Some bikes (such as the Velo model shown above) come with enhanced features which make it easier for new riders to slowly adapt and learn balancing skills. Others feature footrests for more confident riders who know how to get a good glide going but have trouble keeping their feet off the ground. Lastly, consider where your child will be primarily riding their bike. 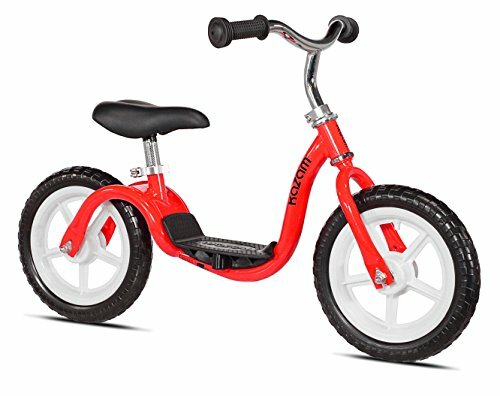 If you plan to let your toddler wheel the bike around the inside of the house, rubber or foam tires will be most ideal. A gravel driveway will require tires with good traction and are unpoppable. If the child will be riding in an area with a lot of downhill or sloping features, choose a bike with a handle brake so it’s easier for them to stop. These are just some key examples, but the key is to take note of the area around your home will the child will be riding and identify any features or qualities of the ground that may impact the bike performance on those surfaces. Then choose a bike with tires that would be most appropriate for those surfaces. Of all the bikes we presented here, the 12 Sport bike by Strider is our most favorite. We like this bike the best because it seems to have something for every rider, from younger to older. 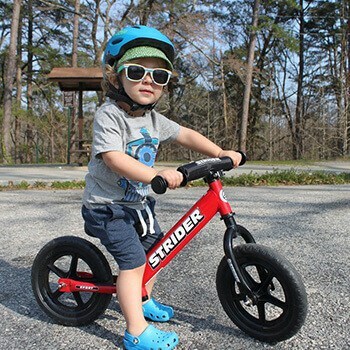 Because of this, the Strider provides the capability to truly last your child years, and to grow along with them, thus saving you the hassle from having to upgrade to a different bike as your child ages. Younger riders will benefit from this bike’s smaller-sized handlebar grips and comfortable seat, while older riders will be able to ride rough thanks to the puncture-proof tires and durable frame. Additionally, the 6-7 lbs. The weight of this bike makes it easy enough for a small child to handle, while still offering the strength and stability needed for older riders.